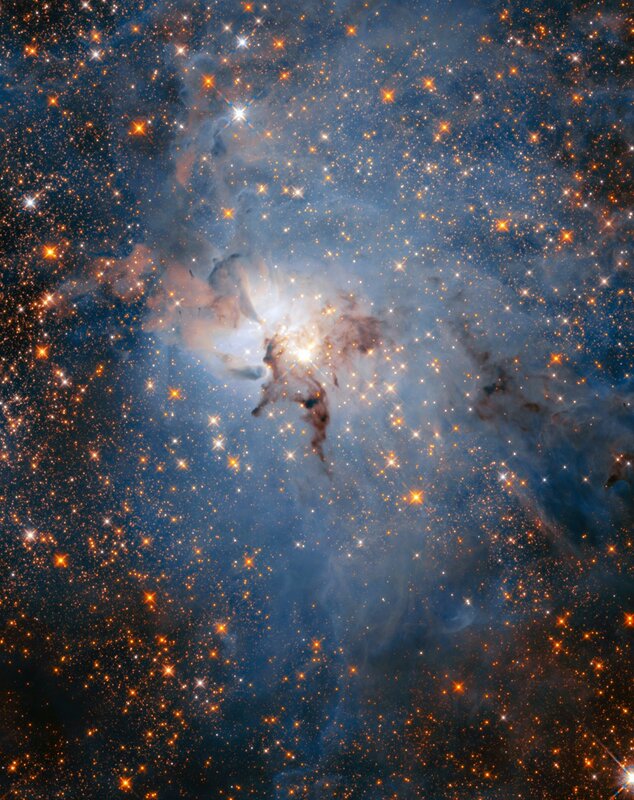 This colourful cloud of glowing interstellar gas is just a tiny part of the Lagoon Nebula, a vast stellar nursery. This nebula is a region full of intense activity, with fierce winds from hot stars, swirling chimneys of gas, and energetic star formation all embedded within a hazy labyrinth of gas and dust. Hubble used both its optical and infrared instruments to study the nebula, which was observed to celebrate Hubble’s 28th anniversary. Since its launch on 24 April 1990, the NASA/ESA Hubble Space Telescope has revolutionised almost every area of observational astronomy. It has offered a new view of the Universe and has reached and surpassed all expectations for a remarkable 28 years. To celebrate Hubble’s legacy and the long international partnership that makes it possible, each year ESA and NASA celebrate the telescope’s birthday with a spectacular new image. This year’s anniversary image features an object that has already been observed several times in the past: the Lagoon Nebula. The Lagoon Nebula is a colossal object 55 light-year wide and 20 light-years tall. Even though it is about 4000 light-years away from Earth, it is three times larger in the sky than the full Moon. It is even visible to the naked eye in clear, dark skies. Since it is relatively huge on the night sky, Hubble is only able to capture a small fraction of the total nebula. This image is only about four light-years across, but it shows stunning details. The inspiration for this nebula’s name may not be immediately obvious in this image. 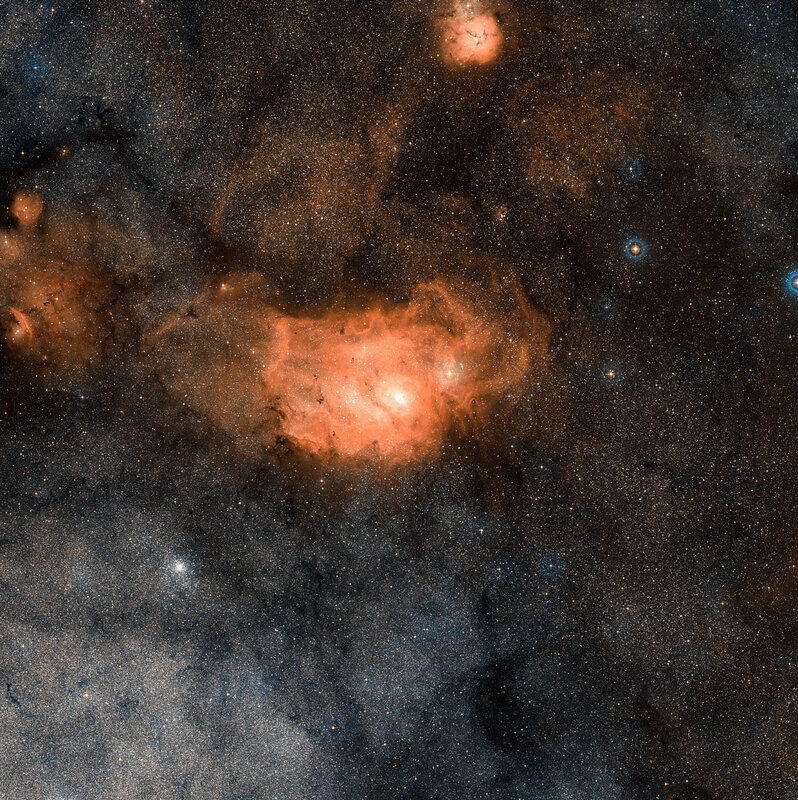 It becomes clearer only in a wider field of view, when the broad, lagoon-shaped dust lane that crosses the glowing gas of the nebula can be made out. 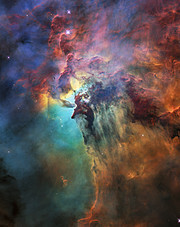 This new image, however, depicts a scene at the very heart of the nebula. Like many stellar nurseries, the nebula boasts many large, hot stars. Their ultraviolet radiation ionises the surrounding gas, causing it to shine brightly and sculpting it into ghostly and other-worldly shapes. The bright star embedded in dark clouds at the centre of the image is Herschel 36. Its radiation sculpts the surrounding cloud by blowing some of the gas away, creating dense and less dense regions. Among the sculptures created by Herschel 36 are two interstellar twisters — eerie, rope-like structures that each measure half a light-year in length. These features are quite similar to their namesakes on Earth — they are thought to be wrapped into their funnel-like shapes by temperature differences between the hot surfaces and cold interiors of the clouds. At some point in the future, these clouds will collapse under their own weight and give birth to a new generation of stars. Hubble observed the Lagoon Nebula not only in visible light but also at infrared wavelengths. While the observations in the optical allow astronomers to study the gas in full detail, the infrared light cuts through the obscuring patches of dust and gas, revealing the more intricate structures underneath and the young stars hiding within it. Only by combining optical and infrared data can astronomers paint a complete picture of the ongoing processes in the nebula.